Last week schools broke up for the summer which means no more author talks until September at least. I’ve had a lovely time visiting schools during the academic year 2015/16 and I’ve worked with some amazing pupils. I’m very grateful to the staff and pupils of All Saints C of E Primary School in Manchester and Victoria Road Primary School in Northwich who have sent me testimonials I can include on my author talks page. I’ve shared my author story with over 5000 pupils so far and I’m hoping to do even more author talks in the academic year 2016/17. My brother has moved to London to become a primary school teacher and I’m looking forward to doing an author talk in his new school… I’ll have to add some embarrassing photos of us growing up to my assembly presentation for that one! There’s only a month to go until my Zayn book comes out in America so I’m very excited about that. I’m looking forward to my author copies arriving any day now. A few weeks ago I was interviewed for The Today Show in Australia which was pretty scary but thrilling at the same time. 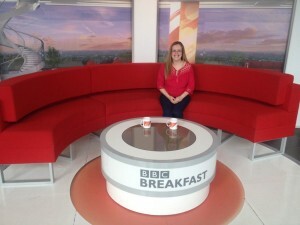 Sadly I didn’t get to go to Australia but it was still exciting to visit the BBC studios in Manchester to film it. I’m currently writing a new Miley Cyrus book for my American publishers and planning more books – I will of course keep you informed.